Four members of the Paynesville chapter of the Future Farmers of America (FFA) learned a lot about agriculture during their recent trip to Kentucky for the organization's national convention. But they learned even more about people, they said. In late October, junior Shawn Buerman, junior Adam Flanders, senior James Jansen, and junior Stephen Lenzmeier - all officers of the local FFA chapter - spent four days at the national convention in Louisville. The goal of the convention was to meet new people, attend career shows, and enjoy agricultural exhibits and seminars. But with more than 40,000 FFA members at the convention, each of the PAHS officers was thrilled to spend time with other people from all over the nation, all with the same interests. "It was fun to see so many kids from so many places, all wearing blue coats," said Buerman, who is the secretary of the PAHS chapter. Buerman took the trip, in part, because he had never left the state and thought this would be a good opportunity for him. Just knowing that everyone there had the same interests made it easier to make new friends, he said. FFA officers from PAHS - from left, Shawn Buerman, James Jansen, Adam Flanders, and Stephen Lenzmeier - attended the national FFA convention in Louisville, Ky., in October. Jansen, the local treasurer, had already done a lot of traveling, but he also found that it was easy to make friends with kids from other places because they were all interested in agriculture. Lenzmeier, president of the PAHS chapter, agreed that the convention did a lot to improve their social skills. Flanders, who is the chapter's vice president, liked meeting new people, but he and Lenzmeier both marveled at how many different ag-related careers they learned about. Because Kentucky is a large horse raising state, Flanders was pleased to learn more about horse farms. He was surprised to learn about the billions of dollars invested in horses. All four of the PAHS students were amazed at the broad range of meanings covered by the term agriculture and the different ways that people farm. From ranchers to cotton growers, dozens of ag-related careers were represented at the national convention. FFA is a national program for high school agricultural students. It is dedicated to making a positive difference in the lives of students by developing their potential for leadership, personal growth, and career success through agricultural education. FFA activities, including competitions and conferences, are intended to help each student reach his full career potential, even in non-agricultural fields, according to Natalie Todnem, the PAHS ag teacher and FFA advisor. Flanders and Lenzmeier were already planning to pursue careers in agriculture after graduation - Flanders possibly in ag sales or as a diesel mechanic and Lenzmeier as a crop and dairy farmer. They both believe that FFA and their convention experiences will help them in their careers. The contacts they made at the convention could be of particular importance, giving them a chance to learn from farmers and ranchers in other places. Buerman still plans to study physics or chemistry, but because of the social interaction he enjoyed at the convention, he has decided he may want to work with people. And Jansen already knew he wanted to be a teacher, but now, because of his experience in FFA and at the convention, he's considering becoming an ag teacher. 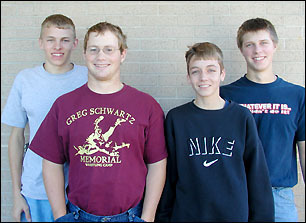 The 2004 FFA convention was the organization's 77th annual convention. While PAHS used to send students to the convention, this group was the first to attend since the mid-1980s. The students appreciate the financial help they got from the Lake Henry Lions and Paynesville American Legion, without which the trip wouldn't have been possible they said. All four FFA officers agreed they would like to attend the national convention again.